If you’re looking for a motorcycle accident lawyer in Los Angeles, there are so many to choose from. Unfortunately, very few of them actually try many cases involving motorcycles. Many of them are just “personal injury” or “car accident” lawyers who happen to be looking for an extra pay day. They don’t understand and/or lack awareness of how motorcycle cases are different. And, it should be clear; they are different in many ways. Some of them are critical, others less so, but each can help to make your case that much more compelling. When you have an attorney with a background in motorcycle cases, you give yourself the best chance to get the compensation you deserve. There is no feeling of freedom like riding a motorcycle. When you ride one, it is you and the open road – literally. If you want, you can put your foot down and touch the road. That’s a true freedom that’s very real. However, all that freedom can leave you more vulnerable to being hurt when you’re in an accident. After you’ve been hit while driving your motorcycle, you deserve to have a true motorcycle accident lawyer in Los Angeles. With a lawyer by your side who understands the ins and outs of trying a motorcycle case, you’ll be able to take on the insurance companies and anyone else. Here at the LA Injury Group, we boast a team that truly specializes in motorcycle cases. They don’t primarily work on other kinds of personal injury cases; they do motorcycles. They have years of experience in dealing with cases that involve motorcycles. What that means is that they’ve seen so many motorcycle crash cases before, and now they can put that experience to use for you in your case. The insurance company can throw so many different kinds of tactics at you. So, you deserve a lawyer that has been through it before. When a client is hurt in an automobile accident that isn’t their fault, their attorney doesn’t have to convince anyone (jury or otherwise) that the injured person was good at driving their car. Nor do they have to point out that driving a car is a safe, fun activity. Unfortunately, that still happens with motorcycle cases. Sometimes, some people see someone that was hurt in a motorcycle crash and think: ‘that’ what they get for riding one of those.” Of course, the strong majority of motorcycle accident cases end up with the person being at fault who wasn’t driving the motorcycle. This stereotype still exists, however. 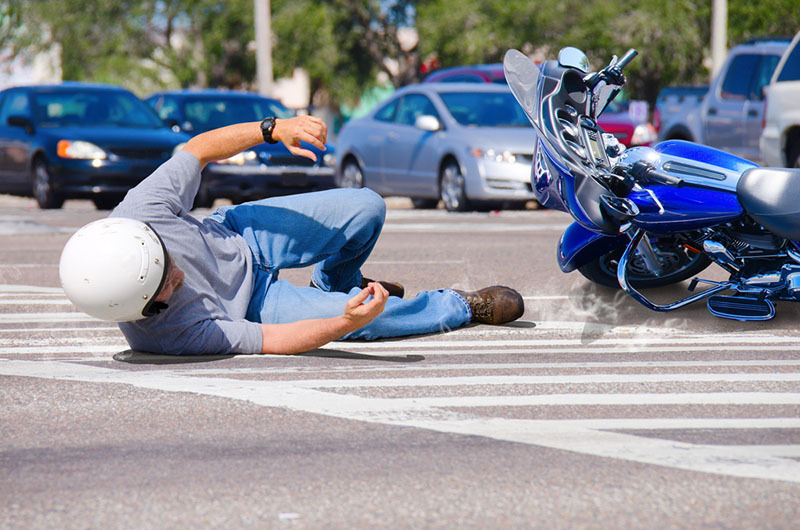 At the LA Injury Group, our motorcycle accident lawyer in Los Angeles team knows how to deal with this. Additionally, we know how to deal with the other complications that can pop up from time to time that deal with motorcycle accident cases. Other law firms have to guess, because they don’t have lawyers with the kind of focus on motorcycle accident cases that we do. Motorcycle accidents are different than any others, and they deserve to be treated as such. No one ever prepares to be in a motorcycle accident. When you’re out on your motorcycle, you’re trying to get to where you’re going. Or maybe you’re out on a joyride; trying to take in as much of southern California as you can from your beloved motorcycle. If you’ve been injured in a motorcycle accident, it’s probably for the first time. A majority of people who get hurt in a motorcycle accident have never had that happen to them before, so the entire process can be confusing. Here at the LA Injury Group, we understand that. That’s why we try to make the process as easy as possible. When you’re ready to reach out to an attorney, it’s simple to schedule a free consultation with a motorcycle accident lawyer in Los Angeles. You just call us or set it up through our site. We understand that after you’ve been in an accident, you probably aren’t looking to drive clear across town without having a meeting schedule. For many people, it can be difficult to reach out to an attorney even after they’ve been injured. We want to make a difficult time in your life that much easier. That being said, there are ways that you can make your case easier on you, too. One thing that every motorcycle accident lawyer in Los Angeles on our team recommends: don’t mention much (if anything) about your case on social media. In the immediately aftermath of your accident, it’s perfectly harmless. Putting up a post that lets friends and family know you’re OK can be a great relief to those who truly care about you in life. That’s a fine idea. However, going into more detail can be harmful. Someone else hit your motorcycle, injuring you. Of course, it’s perfectly normal to be mad about this. When you’re mad, if you’re like many people, you need to vent. However, venting about this on social media can hurt your case. No matter how wronged you were, how much it’s the other person’s fault, it can look bad if you’re too harsh or yelling about it. Always remember: insurance companies have what are essentially limitless resources. They can throw money at any problem. And, if you want to get money from them, you are essentially a problem. The insurance company can turn their investigators on you to look at your own life. Most people that we tell this to are surprised, but it’s true: an insurance company that has the resources to bring experienced investigators in to examine the crime scene can then turn those same investigators onto searching through your life. It happens quite a bit where these investigators follow someone how was hurt in an accident, whether it’s in “real life” or on social media. Often though, we’ve discovered that an investigator from the insurance company isn’t necessarily reading your social media to look for you saying something about the person who hit you (although that can be a boon for them). What they’re looking for is one advantage, one small thing that they can use to weaken your credibility and ultimately, your motorcycle accident case. One way that many insurance companies have been able to do just that is through stalking the social media of someone who’s been injured. Say for example that your foot got quite hurt in a motorcycle accident. You file a claim for this, as it’s not your fault. You receive medical treatment, you do everything right – your foot still hurts, but it’s getting better. So, you go back to work. Maybe your treatment is going well, and your foot is recovering much faster than even the doctors anticipated. Perhaps you celebrate by going out with friends, and you have a drink or two. One of your friends goes to leave, and you put aside your crutches, wheelchair or the like to stand up and hug them. It’s a nice moment- you with someone you care about. However, that’s exactly the kind of thing that an investigator from the insurance company is looking for. They want to get a picture of something like that to say: “see, the injury wasn’t as bad as the injured party said. Their foot couldn’t be too bad if they were standing to hug this person a few days later.” Of course, that argument is nonsense: maybe you had to muster all of your strength to be able to stand. But, as our motorcycle accident lawyer in Los Angeles notes: why give the insurance company an advantage. The best way to get the compensation you deserve is to hire a team of lawyers who truly understand motorcycle cases. To see the real different, give us a call at (818)210-4558 or go to our site to set up a free consultation.